Hampton Wilkins was born and raised in the Dan River Region. A realtor since 1975, he has been a major player in Danville’s transformation into a thriving, growing city. 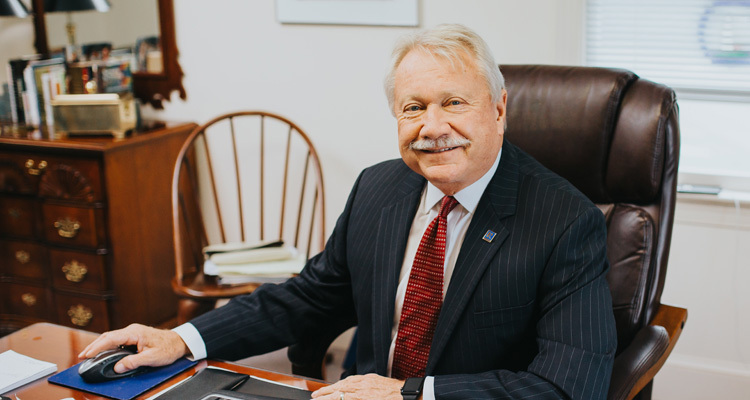 He is a local past president of the Dan River Region Association of Realtors and is well-known throughout Virginia, serving on the state level on numerous Virginia Association of Realtors (VAR) committees throughout his career. Hampton earned his Master’s in Business Administration from Averett University in 1987 and proudly serves on Averett’s Board of Trustees. He also serves on Danville Development Council, Danville Airport Commission, and the Fair Housing Board. Hampton is a charter member of Riverview Rotary and is a recipient of the prestigious Paul Harris award. He has also served on the Boards of Goodwill Industries, Danville Pittsylvania County Chamber of Commerce, Danville Life Saving Crew and Danville Regional Health Foundation. Hampton is also a member and supporter of the Danville Museum of Fine Arts and History, Danville Historical Society and First Presbyterian Church. I feel it is both my privilege and my responsibility to give back to a community that has given so much to me. I am proud to be a third generation Danvillian, and my daughter and grandchildren make five generations. Hopefully, my involvement in the community has in some small way helped improve the quality of life for future generations. It is often said when you love what you do, you never have to work a day in your life. I am blessed daily to combine life, work, and community involvement. The mission statement for Wilkins & Co. Realtors is “To provide the best possible service to our clients, customers and community”. We live that out every day. My father, who I loved and respected dearly, always told me, “Whatever career you choose in life… strive to be the best.” I have never forgotten those words and have always tried to live up to them. My mother, who dealt with adversity her entire life, but remained strong and true to her beliefs. She taught me the value of an honest day’s work and instilled in me the work ethic which I live by today. Also, Ronald Reagan because of his love for our country. He believed in the values our great nation was founded upon. I am asked that question weekly as I bring newcomers to Danville. My answer is always the same: the people…they are our Region’s greatest asset. What do you like to do outside of work and volunteerism? Spending time with my family is number one. Also, taking walks, golf, yoga, travel. I enjoy spending time anywhere near the water…any beach I can reach is a good destination. There are so many, but I would have to say, that bikin g or walking the River Trail; spending time with my grandchildren at Dan Daniel Park and enjoying the YMCA are at the top of my list. A community that is united, working to achieve a crime-free Danville; economic growth that creates good paying jobs for all our citizens. Prosperity for all!